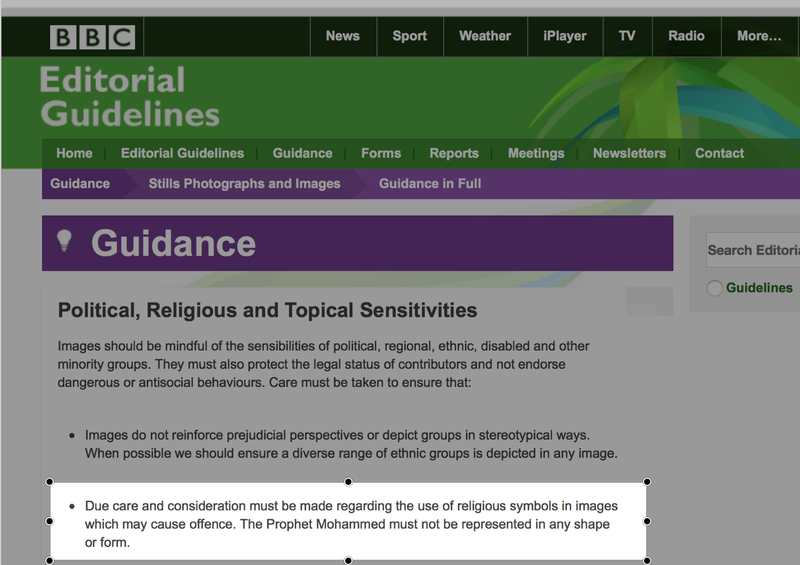 BBC Editorial Guidelines (written in typical BBC PC-speak) forbidding the publication of the Islamic Prophet Mohammed mysteriously vanished from their website sometime after Thursday 8th Jan 2015. The BBC Press office gave the cryptic explanation ‘the guidance is old, out of date’ and ‘is currently being revised’. 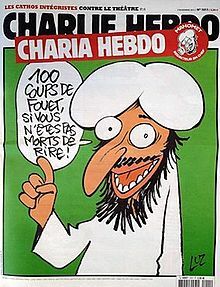 In the wake of the horrendous and vicious attack by Islamic terrorists against the French satirical newspaper, Charlie Hebdo, the BBC’s ludicrous Thursday QuestionTime predictably devoted a segment on the implications of the massacre on free-speech. “I think that’s absolutely outrageous”. The very fact that the BBC had this long standing written ‘guideline’ should be extremely worrying to all who value freedom and free-speech. The BBC is guilty of the most appalling campaign of multi-culturalism, censorship and political correctness against the British people ever witnessed. The BBC’s great nemesis is now the Internet, and for one very good reason: The Internet never forgets. Are we seriously expected to believe that the host of BBC QuestionTime was unaware of ‘out of date’ BBC Editorial Guidelines when he read out the text as it stood on 8 Jan 2015? Are we seriously expected to believe that BBC editors would go against the written guidelines of their BBC employer by exercising their own individual judgement? Are we seriously expected to believe that the BBC has now seen the light and undergone some kind of Damascene conversion in the wake of the Charlie Hebdo massacre that they were wrong to inflict multiculturalism, censoring free-speech and political correctness on the British people? Is it any co-incidence that the web-page with these guidelines mysteriously vanished after QuestionTime was aired sometime on or after 8 Jan 2015? The prompt deletion of these politically correct editorial guidelines serves to remind us that this is more than just a smoking gun. It is the hard evidence that is needed to convict the BBC of the most appalling crime against free-speech imaginable: censorship. It took a relatively little known French newspaper to remind us of the true cost of free-speech, something which the forcibly funded BBC and it’s income of £3.7 Billion a year from the British public fails to grasp. In recent days, BBC has been busy updating their ‘out of date’ Editorial Guidelines. 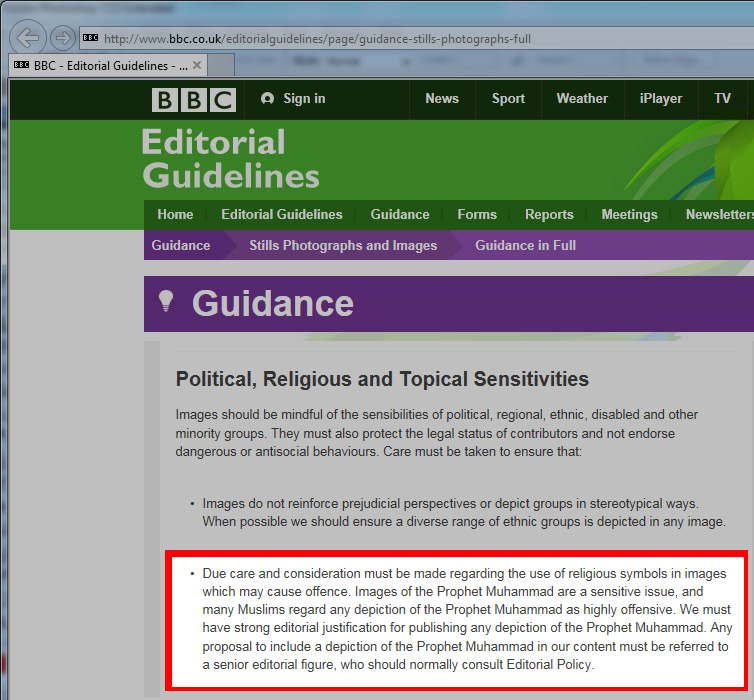 When deciding whether to show the Mohommed image, permission must now be sought from a senior BBC editor. According to the guidelines, this editor is required to ‘normally consult’ (read: comply and apply) ‘Editorial Policy’. In other words, it’s business as usual in the BBC Stasi department of the politically correct…. Self censorship is the worst crime a journalist can commit. It’s like the defeated partisan solemnly digging his own grave.